This exercise is comprehensive and technical, which is among Michel’s favourite exercises. It teaches the riders to be very meticulous in their position, the track they are on and the control of the speed. 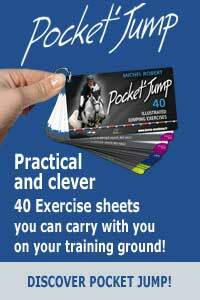 It is a perfect exercise to practise the basics prior to a jumping session. The goal is to program the horse and rider before jumping. The set-up which consists of two ground flexi Jump poles, is really easy to realise and shows no risk for the riders and horses. That said, it will require a lots of focus and some preparation from the rider. He/ she will have to comply with the requirements of a course, practising the flexions to the right and left, the approaches and landings, a certain number of strides between poles, the straightness, some flying change of leads, increasing and decreasing the speed….all that while keeping a light seat, to offer the freedom of movement to the horse. Quite a program. For this session, Michel teaches Charlotte and her mare Rasbury. She starts the exercise at a trot. For less experienced horses and riders, it would be better to start at a walk two or three times. It will allow them to get a feel for the pattern and the requirements of the exercises in a quiet way. Charlotte will have to resolve some difficulties such as keeping her mare straight between the poles and changing the lead in a spot more suitable for the rest of the course. Little by little she gets better at it, thanks to Michel’s advice. Don’t hesitate to practise this exercise. 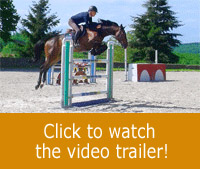 It is an excellent way to test the connection with your horse and the quality of your work before going to jump.